Now you can order Vampire Vineyard wines on Amazon (depending on your state's wine shipping laws) to serve at your next gothic or vampire-themed dinner party. Obviously this works best if you display the bottle so your guests can see the vampire label, rather than open the bottle in the kitchen and bring out wine in glasses. 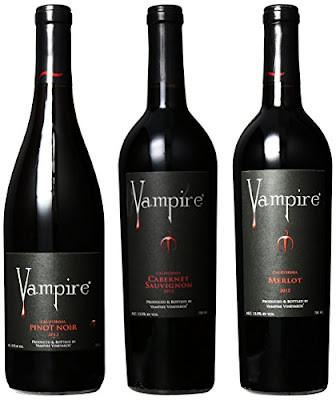 The Vampire Mixed Pack includes a 2012 Vampire Cabernet Sauvignon, a 2012 Vampire Merlot, and a 2012 Vampire Pinot Noir. Each are 750 ml. My favorite white wine is Pinot Grigio. I can't believe I used to like Chardonnay! 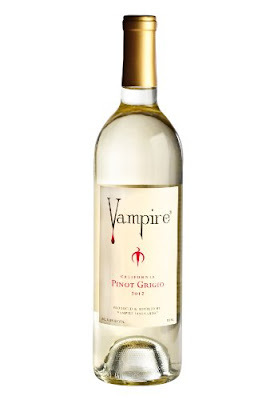 Here's the Vampire Vineyards pinot grigio from 2012. The Dracula pinot noir is from 2007. For summer, they make a sangria called Fangria. The Vampire Vineyards cabernet mixed sampler includes a bottle of 2012 Vampire Cabernet Sauvignon, a bottle of 2009 Chateau du Vampire Cabernet Sauvignon, and a bottle of 2011 Trueblood Cabernet Sauvignon St Helena Napa Valley. 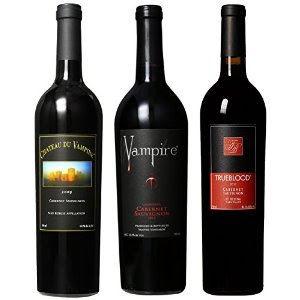 Explore Amazon Wine for more Vampire Vineyards offerings, including the Trueblood tribute wine, and their Vampire Merlot.